Most regular wine drinkers will be familiar with Sauvignon Blanc from Marlborough, and red wine lovers may well have sampled one of the South Island’s Pinot Noirs. But how many of us have explored beyond that? New Zealand is a relatively new wine country, whose modern industry is only around 40 years old but in that time huge changes have taken place and there is now an extraordinary variety of wines coming out of these two islands. Gibb confesses that she is “known to get excited about wine,” and that excitement proves infectious here. She guides us energetically through the history of New Zealand wine, employing a genial style that makes even the section on climate entertaining, without taking away any of its authority. Her chapter covering the grape varieties is far more than just a study of cultivars – as an MW student Gibb was awarded the Bollinger Medal for her outstanding tasting skills, and her keen abilities are put to use here in her descriptions of the flavours involved, while each of the major varieties gets its own fascinating biography, rounded off with a top 10 of ‘must try’ wines. Gibb then takes each of the 10 main regions in turn, starting with Northland, moving southward through Hawkes Bay and Marlborough to end in the South Island at Central Otago. At last count there were 670 producers so rather than turn the book into a directory, Gibb provides a selection of producer biographies featuring the most exciting, innovative and visitor friendly winemakers, along with details on which wines to try. If Gibb’s enthusiasm has you booking a flight, the final chapter will prove invaluable, packed as it is with suggestions on wine-related places to stay and things to do. 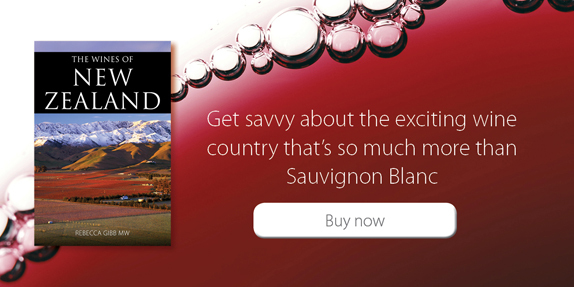 All in all the book is an invaluable resource for anyone keen to adventure beyond Sauvignon Blanc. Rebecca Gibb MW is an award-winning wine journalist and editor. Securing her first editorial role at UK wine trade magazine Harpers after being named UK Young Wine Writer of the Year in 2006, she has since edited several print and online publications. Rebecca contributes to prestigious titles including Decanter, The World of Fine Wine, LUX and Wine Business International, in addition to running a small business, The Drinks Project. In 2015, Rebecca became a Master of Wine. Having lived in New Zealand from 2010 to 2016 with her Kiwi husband and son, Rebecca recently returned to the UK. She maintains her strong ties with the people and wines of Aotearoa. We asked our authors to recommend some wine-based trips and activities. Here’s what they came up with. Glancing behind me as I write this, at shelves loaded with wine books, I can count perhaps a dozen Classic Wine Library titles, from the black-spined Faber & Faber editions, through the less soberly jacketed Mitchell Beazley versions to the elegantly presented and up-to-date publications from Infinite Ideas. I am not sure when I bought my first one, or which it was, probably Julian Jeffs’ Sherry or Anthony Hanson’s Côte d’Or, but I am certain that without the Classic Wine Library my journey of discovery through the world of wine, from keen consumer to Wine Editor of Ireland’s Food & Wine Magazine, would have been more challenging and certainly less enjoyable. The library has been a go-to reference point for longer than I can remember. I always regarded the Classic Wine Library like a club – not exclusive but inclusive – led by authoritative and informative writers whose knowledge and enthusiasm for their subject shone through on every page. Thus it was with great excitement that I joined the club over a year ago, commissioned to write about the wine region closest to my heart – Burgundy’s Côte d’Or. The excitement was not so great as to blind me to the challenge ahead – the labyrinthine complexity of its nomenclature alone intimidates the neophyte – but I could also call on one asset beyond value. A little over 10 years ago my wife and I were fortunate to buy a house in the Côte d’Or and since then we have visited the region dozens of times. Thus I was able to explore at leisure, chasing up the back roads, discovering unexpected delights, as well as more formally, packing in scores of visits to winemakers, from the biggest négociants to the smallest domaines. I never – ever – tire of the Côte d’Or and I believe it is now at one of the most exciting periods in its history. That history has seen it stamped by innumerable forces, two of which – the French Revolution and the scourge of phylloxera – are largely responsible for its shape today. And perhaps now, as the memory of their trauma fades, the côte is slipping into the grip of another pair: climate change and the extraordinary surge in the prices paid for mere scraps of prestigious vineyard land. How these will shape the côte in the decades to come is still a matter for speculation, but they make every visit challenging and rewarding in equal measure. Notwithstanding the undeniable influence of these forces, at a micro level the Côte d’Or is probably producing more high quality wine today than at any point in its history and hence it rewards repeated exploration. There is always something new to be seen, to discover, change is ever present – and this in a region that appears unchanging to the casual observer. In Côte d’Or: The wines and winemakers of the heart of Burgundy, I hope I have managed to present an early twenty-first century snapshot of an era that future historians may well come to label as a golden age – for what I consider to be the world’s greatest wine region. Côte d’Or is published on 8 September 2017, priced £30, available from your favourite book shop. Or click here to buy your copy today. One of my favourite tasks as editor of the Classic Wine Library is choosing the photos that grace the covers of the books. A great cover is essential in creating the right first impression. Reading the books makes me (and I assume others) want to sample the wines and visit the places talked about, but readers first need to be enticed into picking up the book. A beautiful and interesting cover picture can make all the difference. Picture research can sometimes be quite wearisome, particularly if you are desperately trying to depict some abstract concept in an original way. But the Classic Wine Library, with its series focus on inspiring photos of the landscapes behind the wines under discussion, is different. It is important to have a reliable and expert supplier when purchasing such photographs. Without having visited many of the places myself how can I be sure that the photo I’m looking at is really of Roussanne vines in southern France and not Chardonnay grapes growing in South Africa? So over the last few years we’ve made this task a lot easier by working with a specialist wine photographic agency, which features a huge selection of wine-related photos from all over the world and is run by Mick Rock, a very knowledgeable and helpful, not to mention world-renowned, photographer. But there’s more to cover design than finding a beautiful image. The title font used by our designer is called Trajan and was designed by typographer Carol Twombly. Although the font itself is less than thirty years old it is based on the inscription found on Trajan’s column, built by that Roman Emperor around the first century AD. Unlike the column’s inscription the information in these books is not carved in stone, as the world of wine is in a constant process of evolution. However we think that this elegant font, which is only available in capital letters, lends our books a certain authority and timelessness. Over the last month we have signed up new books on the wines of New Zealand (Rebecca Gibb), Sake and other Japanese wines (Anthony Rose) and the wines of Bulgaria, Romania and Moldova (Caroline Gilby), and I am looking forward to taking virtual journeys through those countries very shortly. So watch this space for new covers. We hope you like them and find the photography as inspirational as we do. Titles being added to the library this year include The wines of Canada, Côte-d’Or, Rosé, The wines of northern Spain, Amarone and the fine wines of Verona and The wines of Greece. You can find out more here and order published books at 20% discount here. One of the great things about working in publishing is the conversations you get to have with experts and enthusiasts in a variety of fields. In my time in the world of books I have worked with people writing about medicine, religion, philosophy, self-help and business. But perhaps the most enthusiastic people I have met are the experts in wine with whom I’m involved at the moment. What is more because their field of expertise lends itself to conviviality some of the conversations we’ve had with authors of books in the Classic Wine Library have taken place over a glass of red or white. It’s not that the authors in those other fields were lacking in social skills but given the choice between meeting an author at the hospital to pore over images of skin diseases or meeting one in a wine bar to talk about the wines of Languedoc, Spain or northern Italy, the decision is pretty easy. One of our most eminent authors is Julian Jeffs. He is also a generous host and the owner of an impressive wine cellar, some of which Infinite Ideas was privileged to experience over lunch (cooked by his wife) at our first meeting to discuss the most recent edition of his classic book Sherry. And I have encountered several authors who think it quite normal to have a glass of sherry or madeira for elevenses – whereas if I suggested this back at the office (even given that the Infinite Ideas office is a pretty relaxed place) people might start to worry. Apparently having one at eleven is the more sensible of two available alternatives – the other option being to have eleven at one. In any case, inebriation is not the aim here (or so I am led to believe), and any partaking of wine is always accompanied by an evaluation of its merits. A couple of years ago Infinite Ideas spent a particularly relaxed (by which we don’t mean sozzled) afternoon in the company of Richard Mayson and Julian Jeffs as they discussed the wine trade and wine writing. We were able to sit back and listen to these two experts chat about the subject they know best. One thing that particularly struck me, which I had not considered before, was that writing about wine actually has played an important part in the trade. Once producers realised they and their industry were being written about they had to clean up their acts and practises such as adding sugar to sherry, which were common when Julian began writing on the subject in the 1960s have now disappeared. Wine writing does continue to influence the trade and help ensure quality; as Julian noted, ‘I think the job is still to keep the standards up and to tell the truth about wine in some detail to serious wine drinkers who want to know it.’ So while Classic Wine Library books will not educate the next generation of heart surgeons, help somebody manage their depression or give them the tools to become the next Bill Gates it’s good to know that they are making a difference to the wine we all enjoy drinking. Infinite Ideas dropped in on a conversation between Julian Jeffs and Richard Mayson in February 2015. They spoke about changes in the wine world over the last 60 years, especially in the field of fortified wine. You can read the whole conversation here. Find out more about forthcoming Classic Wine Library books here and order published books at 20% discount here. The problem with the discipline of nutrition is that it has a tendency to make us think of eating as a science, and lose sight of the fact that food is actually something quite wonderful and, dare I say, a little magical. We have become obsessed with looking behind the curtain to understand HOW IT ALL WORKS, but has it led to a better understanding of what nurtures us as humans? After all we have been eating for millions of years; in examining the microscopic detail, have we missed the big picture? In the last few centuries nutrition science has developed with the goal of improving our health – identifying components in food, separating them from the food to study them, and reducing what we eat to a collection of elements. We’ve counted calories, weighed and measured our fats, proteins and carbs, and separated foodstuffs into ‘good’ and ‘bad’ – good cholesterol and bad cholesterol, good fats and bad fats, good carbs and bad carbs. But when we separate the nutrient from the food it can lead to us overcomplicating eating. Recently the fad for ‘clean eating’ has led to a proposed new eating disorder, dubbed ‘orthorexia’, with people’s obsession with healthy eating leading to problems with both their physical and mental health. So can we rely on the experts to tell us what to put on our plates – do they really know what’s best for us? Well, yes and no. The challenge with science is that we are so good at it these days we are constantly making new discoveries. And because of this the guidelines are frequently updated. So while in the 1980s we were all told that margarine was better than butter, nowadays the more natural hard fats such as butter and lard are creeping back into favour. And science is rarely simple and occasionally not particularly pure either. There has been controversy recently over studies from the 1970s into fat and sugar. We were told at the time that they revealed that fat was the big killer but now it seems that the studies were misrepresented (or worse) – sugar may have been the culprit after all. No wonder it is so easy to get confused about food. So how can we simplify eating while ensuring we consume foods that nurture our bodies? Well I don’t think we can dismiss nutritional science out of hand. There have been some amazing steps forward in our understanding, but at the same time there is a lot more going on when we eat than science can unearth by breaking food down into its constituent parts. It is somewhat arrogant to assume that the latest piece of research, or superfood discovery is the end of the discussion in nutrition and what creates health. We can take a leaf out of food writer Michael Pollan’s (author of books such as In Defence of Food) book in learning to eat ‘real’ food. By this we mean not taking short cuts, cooking meals ourselves from scratch, using great ingredients. Following that one simple rule will improve your health no end as you’ll be avoiding all those unnatural chemicals added to manufactured foods and cutting back on sugar, salt and processed fat without even thinking about it. Also of importance is eating together with our families or loved ones, taking the time to enjoy meals rather than grabbing food on the go and being wary of massive food fads and fashions. We can avoid the scare stories in the popular press and the flash in the pan obsessions over this nutrient or that superfood by keeping an eye on advancements in food science through reading more in depth and scientific writing. The key is balance. So don’t feel you have to atone for that chocolate bunny you ate last weekend by spending the next fortnight living off green juices. We shouldn’t obsess over food and can all enjoy a little treat once in a while. 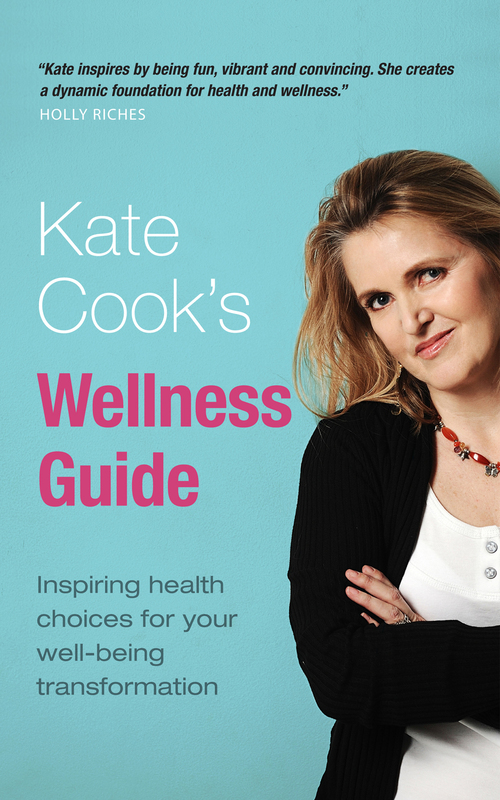 Kate Cook’s Wellness Guide is available free for Kindle for a limited time. Download the book here, or buy the paperback here.